Clonmel Community Gardai are hosting a Benefit Concert supporting C.A.R.E. Clonmel and Scoil Chormaic, Cashel. 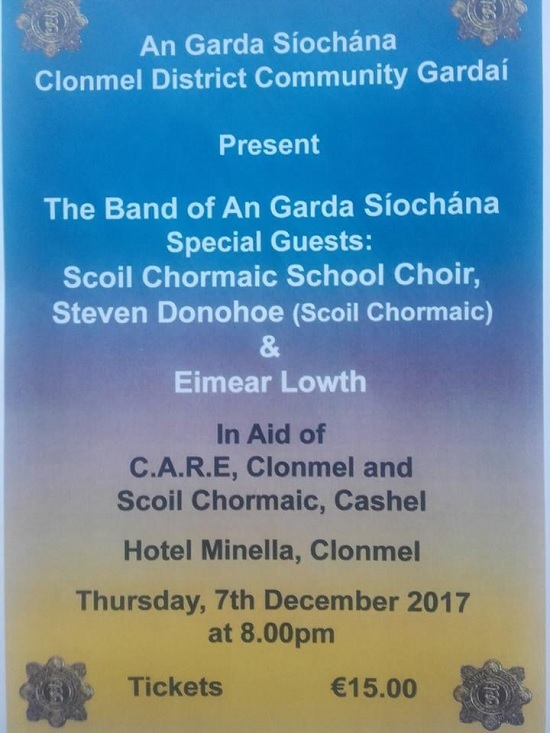 This Concert will take place at Hotel Minella Clonmel on Thursday evening 7th December, 2017 at 8.00 pm. 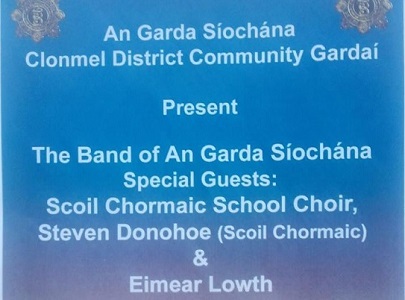 The Garda Siochana Band will be accompanied by special guests Scoil Chormaic School Choir, Stephen O Donoghue (Scoil Chormaic) and Ms. Eimear Lowth. C.A.R.E. stands for “Cancer After Care Relaxation Education”. It is a support centre which aims to provide support and information to anyone affected by cancer in South Tipperary and surrounding area. The C.A.R.E. Centre provides emotional support and practical help to people who have or have had cancer and those who care for them. Scoil Chormaic is a vibrant school in Cashel providing educational services for 219 students ranging from 3-18 years of age with specific educational needs, intellectual disabilities and/or autism. Scoil Chormaic strive to enhance the lives of their students working in partnership with the students and their families. The dedicated staff endeavour to ensure that all their students receive a broad, balanced and enriching curriculum. The staff look at the individual needs of each student in helping them overcome their specific difficulties in order to realise their full potential.